Palmiers should be called monkey ears. When I was a youngster, My Dad introduced me to elephant ears which became my favorite confection. There was a bakery down the shore on Long Beach Island, a barrier island at the Jersey shore. The bakery created the most amazingly tasty and extra-large elephant ears. My Parents would rent a house every year on the island for two weeks and the elephant ears was a traditional treat that I always looked forward to. I was invited via email to submit an entry to the Epicurious Holiday Cookie Contest, as an Epicurious Community Table blogger. After reading the requirements I looked at the existing recipes. 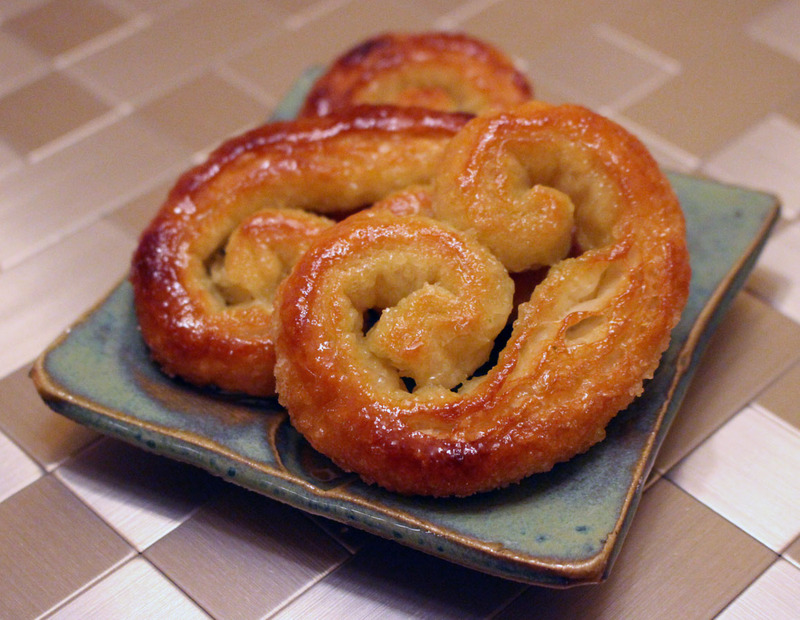 I chose the Palmiers recipe to make and photograph. The original recipe was featured in the 1999 edition of Epicurious. I baked them 7-1/2 minutes then flipped them and cooked them an addition 7-1/2 minutes and it worked out perfectly. Every oven temperature is different, so one needs to make cooking time adjustments based on the performance of their oven. The end result produced a caramelized crunchy outer coating with a soft center. I made two batches which I gave my Dad 1/2 of. It brought back wonderful memories for both of us. This entry was posted in Food Thoughts and tagged cookies, epicurious, holidaycookiecontest, palmiers, traditional on December 25, 2014 by acadia2. As I was wrapping gifts for my family this morning, I realized I didn’t have a large enough box for one of the items. I went out to the garage to see if I had any boxes out there that would be suitable. After looking around, And not seeing anything, I opened our upright freezer and saw a box of frozen chicken pot pies. I removed the pies which were individually boxed, and basically stole their heavy cardboard box. Brought the chicken pot pie box in to the dining room where I was wrapping and the item fit in the box perfectly. I started laughing to myself, remembering what happened last Christmas. We celebrated a second Christmas down at our younger daughter’s house in Delaware since she and her family missed the main celebration of Christmas with us in New Jersey. We brought with us all of the gifts from my parents, my sister and her family, as well as our gifts too. We had hot pastrami sandwiches from a local deli, and MIL had soup. We had a great time and our grandson enjoyed all of the gifts he received. After we left and went home, our daughter wrote thank you notes to everyone. She wrote a thank you note to my sister for an air pump that was given to her DH. He placed it in the garage to use in warmer weather. When my sister received the thank you note and read about the air pump, she called my Mom and asked her if our parents gave an air pump? My Mom told her she didn’t give one either. So then they called me and we didn’t give him an air pump either. We gave him a bottle of gin in a blue-bottle. My sister said, she gave him a bottle of gin too. So I called our daughter, and asked her if they had two bottles of gin. She said no, so there was a second mystery afoot. What happened to the other bottle of gin? I had our daughter K. look through all of the empty boxes, but to no avail. At this point, I can’t remember exactly why K. looked into the air pump box? She called me to tell me that she found the bottle of gin, as it was in the air pump box out in the garage. So then I called Mom and my sister and informed them that my sister had indeed given K.’s DH an air pump. Well she had forgotten all about using the box her air pump was in. We all had a great laugh! I actually am notorious for repurposing boxes for gifts. And it is wise, to open every box, as what is on the label on the outside isn’t necessarily what is inside. This entry was posted in Food Thoughts on December 24, 2014 by acadia2. A Four Letter Word is SNOW! I grill year round, even during Winter nor’easter. When nor’easter storms come up the coast, we almost always get a lot of snow. On the other hand, if storms come from the West, the snow band dumps heavy snows in the Western and Northern suburbs of Philadelphia. 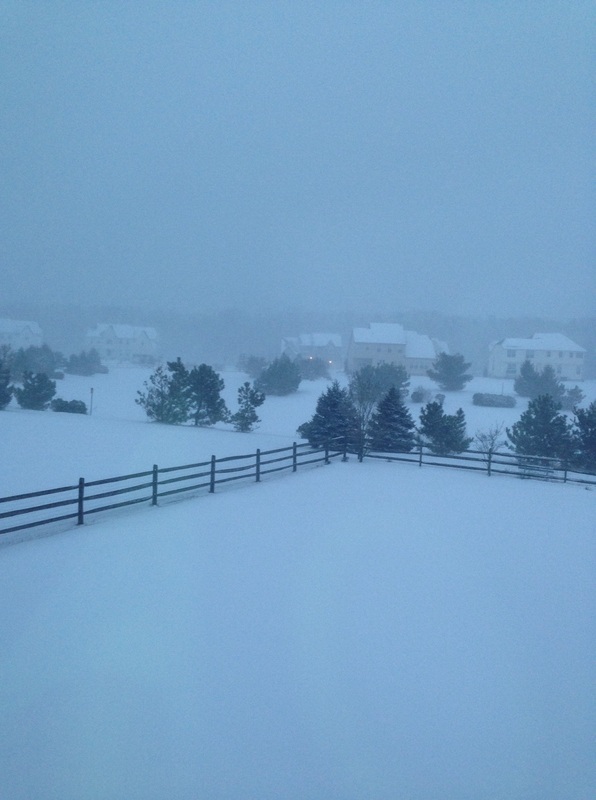 In the Delaware Valley which consists of the Tri-State area of New Jersey, Pennsylvania and Delaware, any depth of snow promotes fear of being snowed in. Even though in my life time, I can only remember being snowed in about three or four times. The mere prediction, or even slight chance, causes a run on the supermarkets. Milk, bread, eggs, snacks fly off the shelves, as well as beer and liquor from the liquor stores. I try to stay away from supermarkets if snow is mentioned, as they become a real madhouse. However, upon an occassion I am forced to go as I am out of something. This coming Winter the rumor is that we are going to have a bad Winter with lots of snow storms, which means the supermarket owners will be happy! This entry was posted in Food Thoughts and tagged beer, Snow, snow storms, supermarkets on December 18, 2014 by acadia2. Boxed cookies to be taken to the cookie exchange. I have never been to a cookie exchange. Last year, I had been invited to one but it was cancelled due to lack of interest. Of course the month of December is a very hectic time of year. So part of an exchange is bringing cookies to exchange. So I bought my tickets for this event back in September and I decided o make Amaretto balls. The only problem is, I can’t go, so my daughter J. will go in my place with my ticket. I am still making the cookies for the event for her to take. 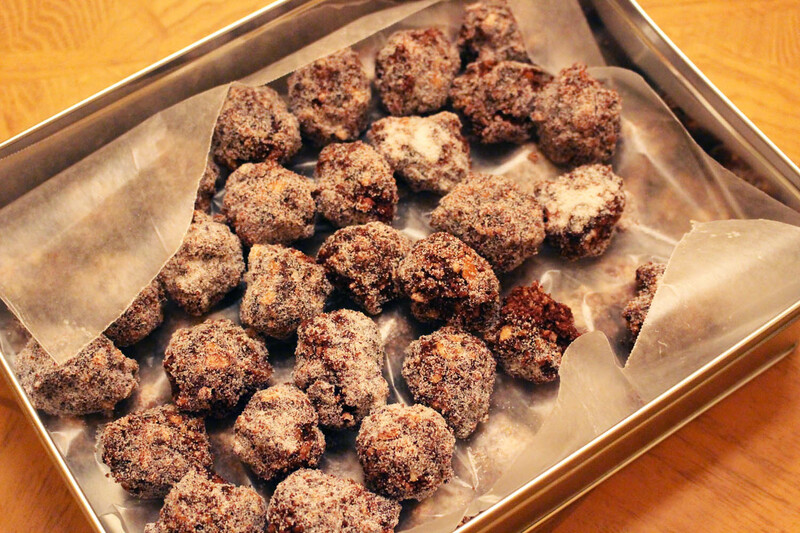 I am making one of my favorite cookies – Amaretto balls. The key is to make them ahead of time, so they have time to cure. They are tasty freshly made, but if they are stored in a metal cookie tin, this treatment causes the Amaretto to really pop. My DH’s Aunt M. was known for her bourbon balls that she made every year for Chanukah. She would grind her nuts very, very finely. The first batch I made was at 1:00 AM, three nights ago and because everyone else was sleeping, I decided to grind almonds in our sunroom to help cut down on the noise. The only problem, is I couldn’t get them as fine as I needed. I made the balls anyway, but had difficulty making them into balls. So the next night, I made a second batch which had a mixture of almonds and pecans. I was able to grind them more finely then the first batch, however, I usually buy almonds ground at the local Amish market. While helping out at our flea market, I asked MIL to fetch me that kind. So tonight I attempted to make another batch of the balls, this time with the extra fine ground almonds. The fine ground almonds is the secret to success. Okay, the real secret of success is having all of the correct ingredients. I ran out of vanilla wafers, so I decided to sub crispy rice cereal for the cookies. It did not work to make the Amaretto balls, however, it does make a great adult ice cream topping. This week I will post the recipe for the Amaretto balls just in time for the holidays as well as the ice cream topping. sugar and Amaretto together thoroughly. 2. Place mixture in refrigerator for 30 minutes. 3. Make approximately 1″ in diameter balls. and place them in a metal tin lined with wax paper. This entry was posted in Food Thoughts and tagged almond, Amaretto, chocolate, cookie exchange, cookies on December 7, 2014 by acadia2. For great beef jerky one must have a decent marinade. 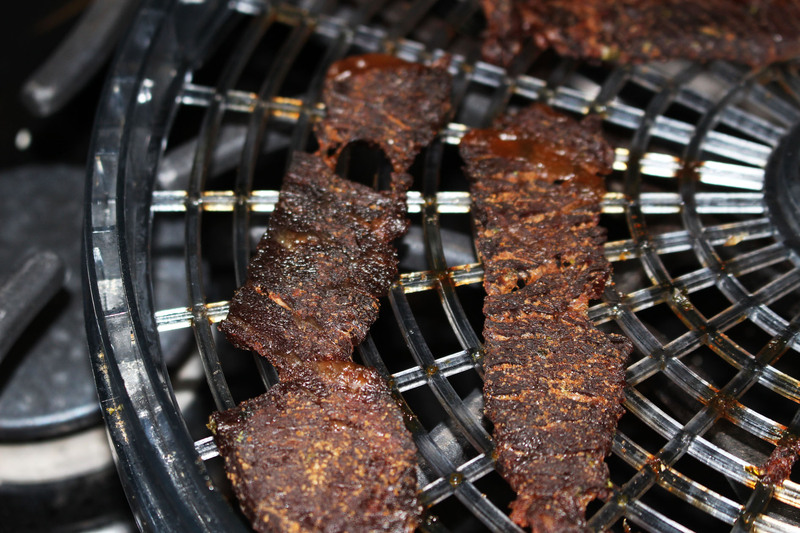 However, the secret ingredient for jerky is not an ingredient at all, but the way it is sliced. DH and I have tried numerous techniques to slice the meat just right. The cut of the meat also has some baring on the procedure too. In the past I always have bought beef brisket, as that cut of meat was the right shape and it had a 1/8″ layer of fat for each slice. We love a touch of fat on the jerky as it has so much more flavor that way. In fact, both DH and I will go though the bag looking for finished jerky with a strip of fat on it. Unrelated to the process of making jerky: The beef brisket reminded me of a funny story. My FIL (Father-in-Law), would always cook a beef brisket as a pot roast which were always delicious. As a newlywed at the time, I decided that I wanted to make a pot roast to surprise DH. (I might also add, that my DH and his family are Jewish, and I am not). My family, never ever used briskets. So I went to the store and picked out a brisket. Nowadays, I have no idea what I was thinking when I was cooking that pot roast, since if I remember right, I just cooked it in the oven as is, with no liquid. It was a doomed effort from the beginning. Well I roasted that brisket for two-hours, three-hours, four-hours, then I tried broiling it and it never browned. I decided that my oven wasn’t working right. Or was it? It was certainly a puzzle? Well, I finally had to yank it out and see what was up with it? Oh, I was successful in surprising DH, but not as I had imagined. We both looked at the pathetic hunk of meat…that is when DH discovered it was a corned beef brisket! That thing was never going to brown, ever! We both had a good laugh about it! This entry was posted in Food Thoughts, Kitchen Utensils and tagged Beef, holidays, jerky on December 1, 2014 by acadia2.